My focus this week was for students to be able to write two different types of short answer responses and learn the essential content of the Neolithic Period and the River Valleys Era. Not only do I want the students to able to do the skills (in this case, write well) and know the content, I want them to be able to know if they know it. I approached the writing using the ACE acronym that I stole from Freeman-Pedia. I love the simplicity of it. ACE keeps them focused on the task at hand and make connections to how they would be assessed. How do I know that the students know the content and can do the skills? Well, the clip below is one document on the progress towards my goal. To address my week's focus I prompted the students to write about how their previous academic journey's would help them or hurt them this year. To do this, they wrote in the way they would be assessed at the end of the week with a new and content-specific short answer response. Their first responses revealed a lot about their writing, but also their previous journey. To help the students know how they progressing on the skill, I asked them provide feedback to their peers on their work. Linda Ashida captured some of this process and you can watch that video below. I noted a few timestamps to help with the viewing and citation of evidence. 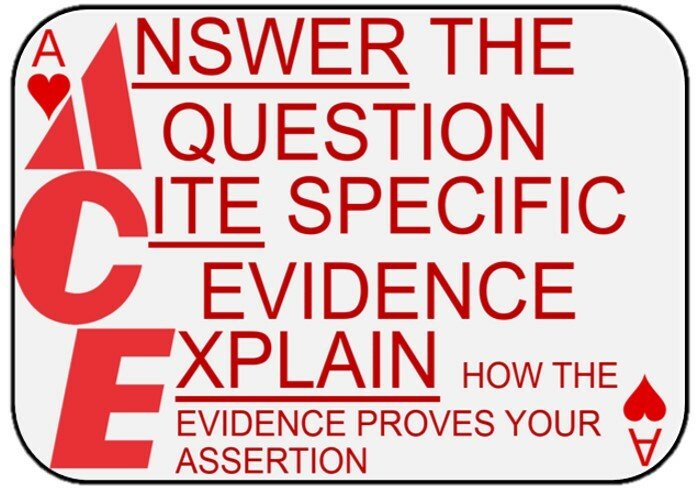 I explain how citing evidence needs to be providing specific evidence. I explain how to explain. Students give feedback to other students. They are underlining and annotating. Here are two samples from the content-specific short answer response at the end of the week. I two content quizzes that were fill in the blank. It covered all the objectives and were fill in the blanks. The kids did really well on these and they proved that they knew the content. Whew! I think I got that one. The writing is a lot harder. In the two samples above, the first student did what the task asked. The student addressed the question in the first sentence by stating a change from Paleolithic and Neolithic societies. The student brought in the specific evidence of warriors, artisans, and elites to validate that point. Finally, the student stated agricultural surpluses and population changes led caused this change. The second student failed to give an explanation as to why the change occurred. This is where most of the student ended up. To be honest, I am completely happy with their progress! They knew the facts and they were able to correctly identify the skills. Keep in mind, that the national average for a short answer out of 3 points is right around 1. It is incredibly hard and to have the students get through two of the parts is incredible progress. Changes for next year, I will only give the students one of the short answer. I will model one more with them before they take the assessment.